Dreamworks Animation’s newest film ‘Home’ directed by Tim Johnson invaded NZ theaters today. Introducing an alien race known as the Boov, one of the two protagonists, Oh, is a funny little character who’s constantly making mistakes. The Boov, led by Captain Smek (aka Captain Smack because he talks a whole lot of it) are constantly on the run from their mortal enemy, and escaping to Earth, they think that what they’re doing is okay and is even helping those already inhabiting it. Obviously, this wouldn’t be the case, but the Boov are blind to that. So moving to Earth, all the humans are gathered up and placed in one section on Earth, all of their belongings left behind and no way to get out of where they’ve been left. But a young girl (the other protagonist) named Tip wasn’t taken with everyone else, most importantly, her mum. And so she waits, and she looks for her mum only to come across Oh who’s in a similar (sort of, not really) situation to hers. Tip is running from the Boov, fearing that if they find her, she won’t find her mum whilst Oh is running because he’s messed up yet again, and this time he was going to face some serious consequences. One of the best things about this movie were the characters. The cowardly Oh and brave Tip’s relationship just further showed us how different they were, and as the film progressed with more feels and more dilemmas, you begin to see changes in Oh and see how much he’s learning and growing. He becomes more considerate over time, begins to realise that there’s more to life than just yourself, like family and friendship. It’s pretty cute, really. But one of my faves was Captain Smek. Y’all shoud all look forward to him. I disliked him so much, I loved him. Another great thing about this film is how despite it being aimed for quite a young age group, a lot of the humour fit well with an older audience, and when we attended the screening, the teenagers laughed so much harder than the kids. The voice actors were also perfect for the characters with Jim Parsons as Oh, Rihanna as Tip, Jennifer Lopez as Lucy Tucci (Tip’s mum’s name hahahahahahaha), Steve Martin as Captain Smek and Matt L. Jones as Kyle. Although I thoroughly enjoyed this movie, I, grudgingly do admit that the plot’s been rather overdone and the misfit’s angle isn’t an original concept. The soundtrack was simply perfect for the film as well and I could see myself jamming out to those tracks outside the cinema. If you enjoy a lot of Rihanna and Jennifer Lopez’s music, then you’ll enjoy the soundtrack because a majority of it is them, otherwise, you might not like it as much or at all. They matched the scenes of the film, and when good music is matched with the right scene, everything is so much more enjoyable. Did I mention that Rihanna’s voice gives me life and so when her tracks started during the film I was so just so happy about it. Also our fellow Boov Oh sings a lot like our beloved Jess, the similarities were uncanny. 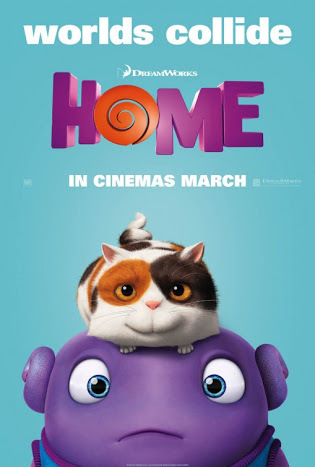 ‘Home’ came out in New Zealand cinemas on the 19th March so definitely check it out. It’s worth the watch and you won’t be disappointed. Just had to take a shot at my singing didn’t you? SMH . . .